Shelley stopped by last month telling us about a fun challenge of using only black and white. Now she’s here today with a round-up which she was kind enough to take the time to do. Here it is! Enjoy! 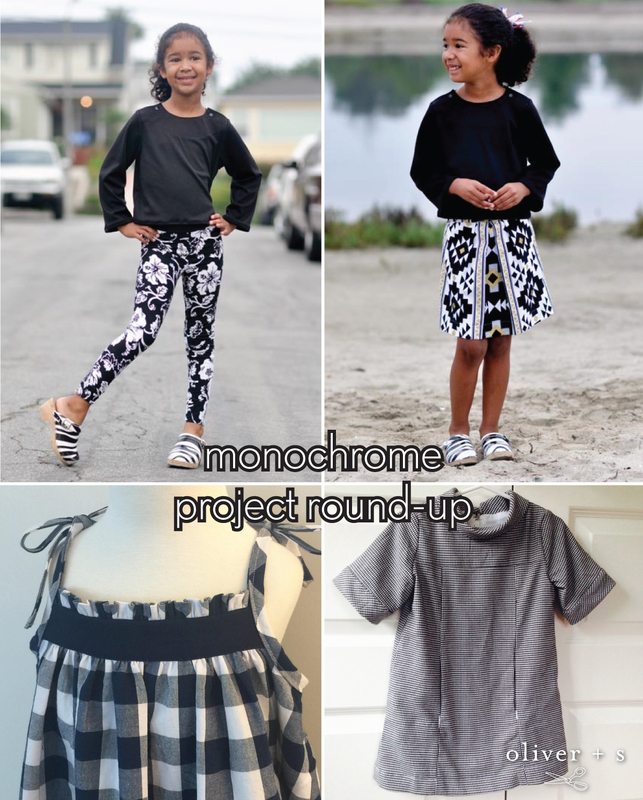 I’m really happy to be bringing together a showcase of all the black and white Oliver + S projects that were sewn as part of our Monochrome Project challenge. There are quite a few projects to share and each of them is absolutely gorgeous. It would seem that there are plenty of sewists who don’t mind being given some direction in the choice of what to sew, and as the conversation is still bubbling away over on the forum, it’s not too late to find some inspiration or have a go at persuading someone else to sew something. In no particular order, let’s take a closer look at the monochrome projects. Tamara (justsewit) covered a big age range with some little baby sewing and some teenage girl sewing. 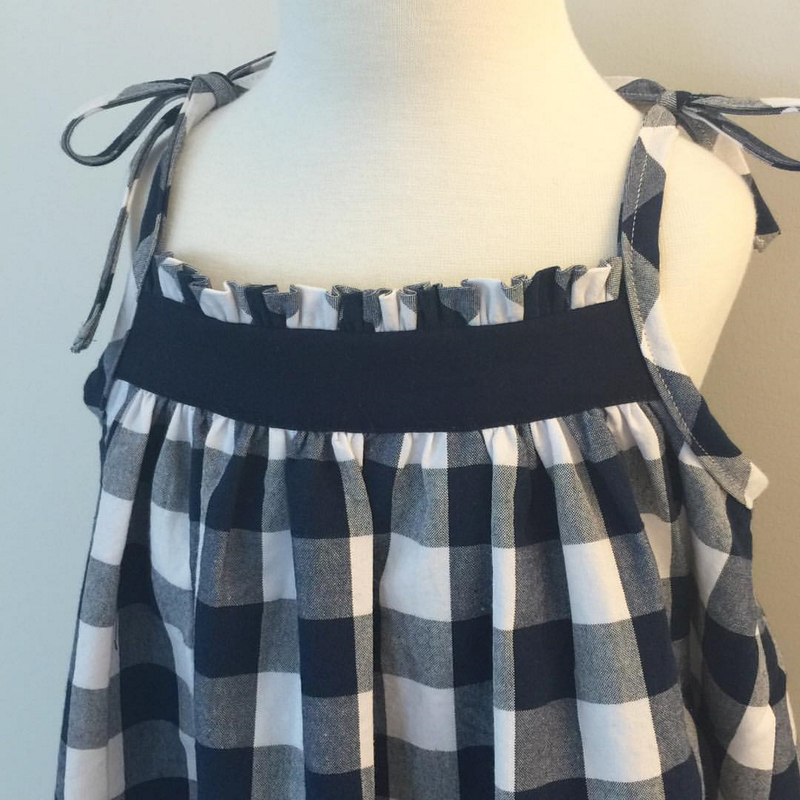 I love the windowpane texture of that little Puppet Show tunic – adorable baby too! 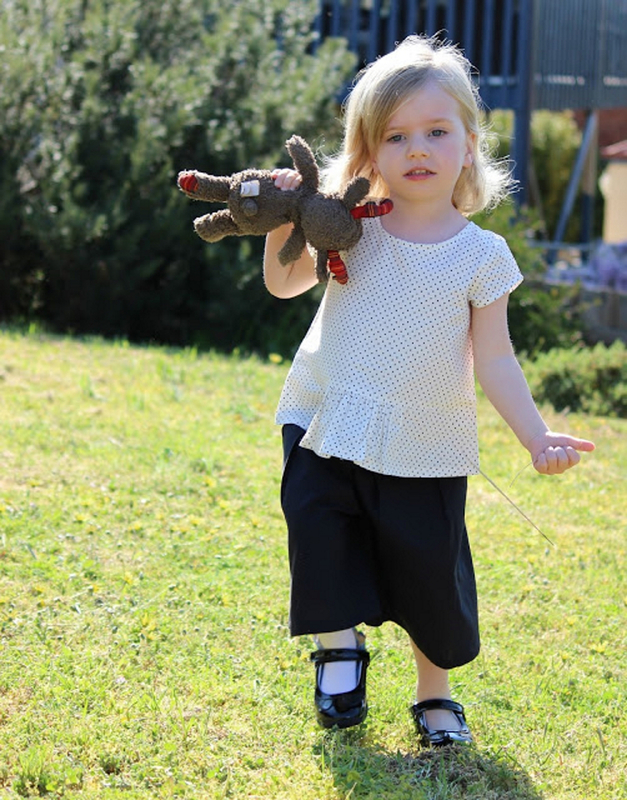 Ann-Maree (nszewist) made a great every day outfit with the Roller Skate tunic and some Playtime leggings. 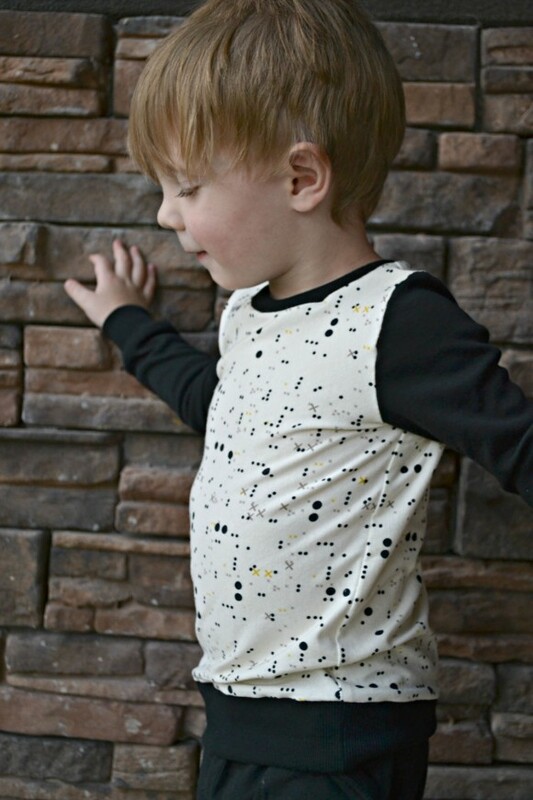 We never did officially decide if grey was technically “allowed” for the monochrome project, but I say absolutely yes, to those lovely After School Pants, and the matching spotty Have It All Wallet. 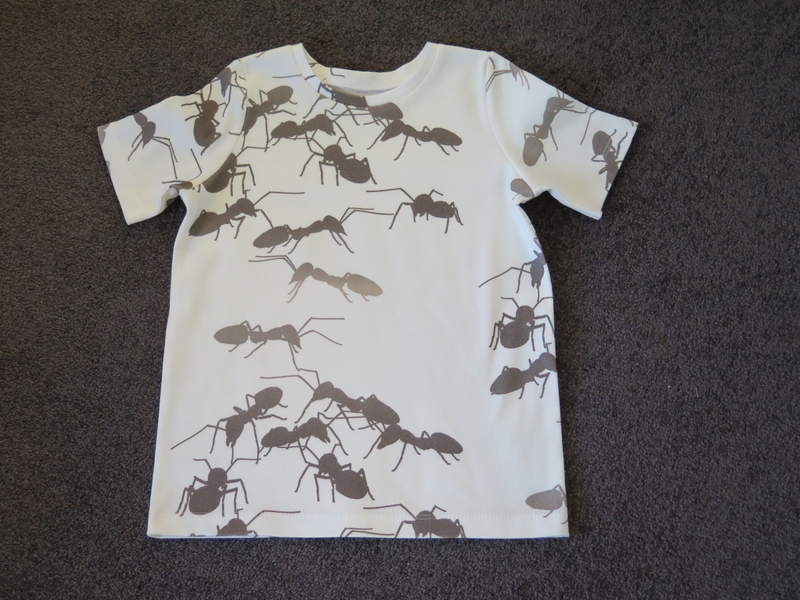 J.Wo always finds the best fabrics and this School Bus T-shirt covered in giant ants is just brilliant! Another School Bus T-shirt formed part of a Back to School Capsule sewn by Paisley Roots. This handsome little dude has scored a great wardrobe consisting of black, cream and grey with some navy and yellow thrown in. I always like getting carried away with a theme, and once the Monochrome Project was underway I was seeing black and white fabrics everywhere. So much for sewing from the stash! I finally got around to making the Playdate pattern and loved it. I used up my long stashed Moda commas fabric for a Jump Rope Dress. I also followed Marie-Michelle’s Dior Rose tutorial and made a headband to match the zebra dress. 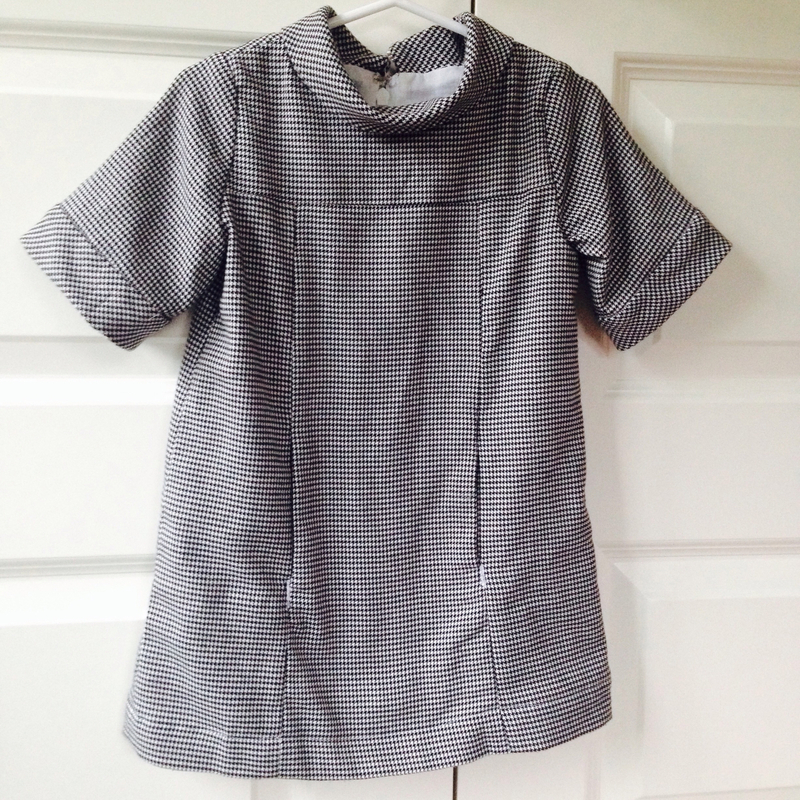 And finally, I made the Lisette B6182 skirt and top for myself and then a Swingset tunic and skirt from the leftovers. I may lay low for a bit now! 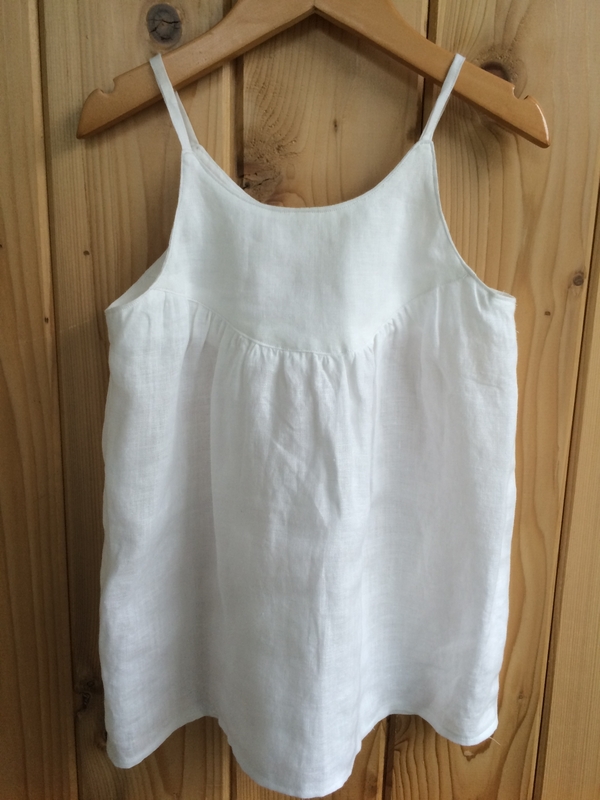 The Swingset pattern was also used for this sweet little white tunic by Rebecca. The back has some coloured buttons, but to me it lacks nothing for being a plain white top. Brit made use of the newly expanded size range of the Swingset skirt and sewed up one for her older daughter, seen here with a cute School Bus graphic tee. For her little girls Brit went on and made two simply stunning Fairy Tale dresses. Can you pick a favourite? Not me, I love them both! Katy kept things perfectly simple with an all white Parachute Polo. Just right for sewing the school uniform. Have you noticed how many different patterns have been used? The colour scheme may have been limiting but it would seem that our access to great patterns is not! One of my all-time favourites is the School Photo Dress and it’s just perfect in a black and white houndstooth. Here’s Housecall2’s lovely version. Jenny stitched a fabulous Carousel Dress. 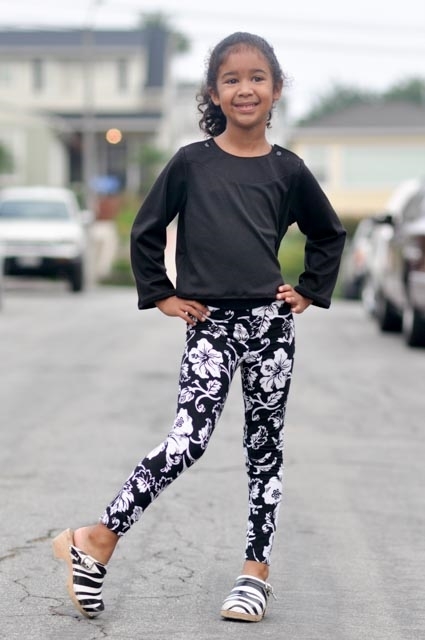 I’m loving the big, simple print – as well as that great hairstyle and modelling! In putting together two patterns you might not have thought to put together, Giddyants has made this divine outfit for her little one. The Butterfly Blouse paired with Lunch Box Culottes. Cute! Here’s a version of the Popover Sundress modified to great effect by elly.elly.elephant. I think we need a tutorial on this one! Another modification that I loved watching in progress is this Jump Rope dress by Ren (The Inspired Ren) over on Instagram. Once she’s sewn those buttonholes I’d like one just like it, only bigger, please. We opened with a collage that included two photos by Janice. How about that girl’s modelling! 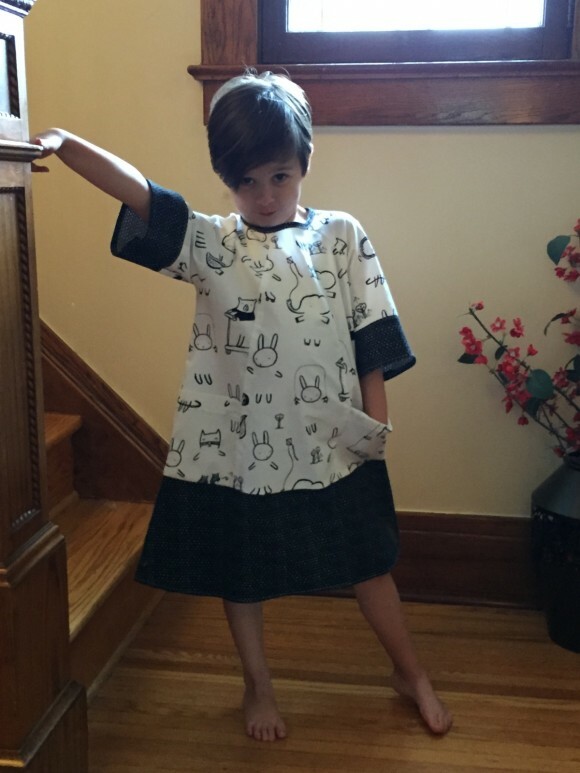 Here Julia is wearing a modified Sailboat Top with Playtime leggings. Now, let’s let her close the show too. 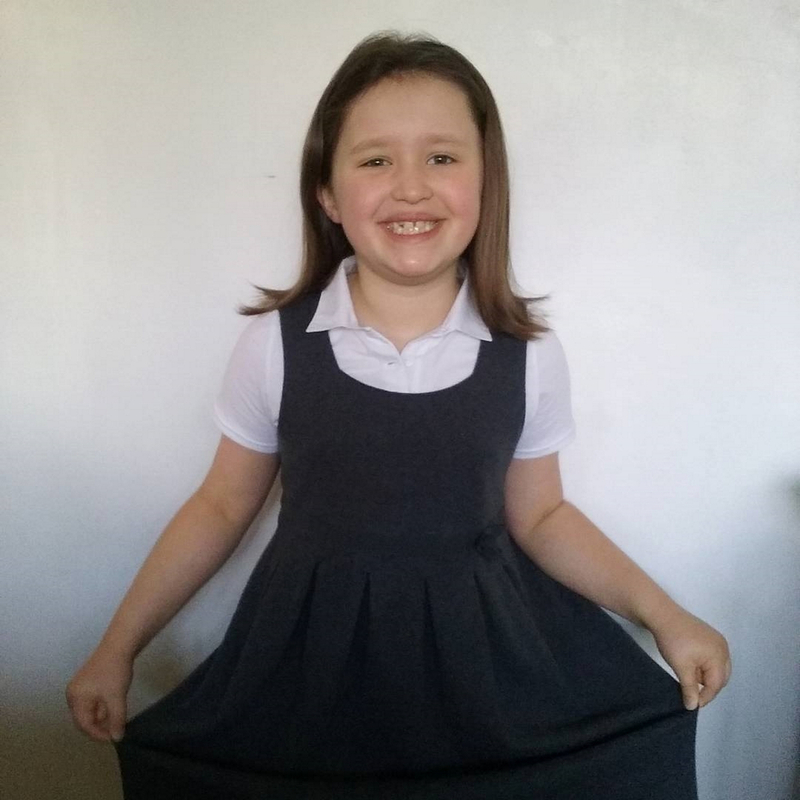 Here she is in the same top, with a Butterfly Skirt, and I’m certain that skirt is smiling at me! Wow that’s a lot of fantastic sewing! Thanks to everyone who participated in the black and white challenge! Amazing sewing, so inspiring, looking forward to the next challenge! The only thing missing is one giant recital with all the kids in it! What a fabulous turnout, and all those projects are amazing. Brava, ladies! It was so much fun to work to a theme of sorts! We all did an amazing job. I love all the projects that were made. It is so difficult to pick a favourite. I too am looking forward to the next one. I call, too, for a tutorial on the pleated top on elly.elly.elephant’s Popover Sundress – it’s perfect in that fabric. I just finished my Gallery Dress, and since it’s black and white I’m going to say it was part of the challenge, ok? I’ll photograph and post it soon. Well done, everyone! Really fun to see what you all made. Oh, love it! My all time favourite colours 🙂 Fabulous creations! I’m so behind in posting! Been doing a lot of black sewing, but not casual clothes… now that dd is in the “advanced” group they are expected to wear only black leotards. Not that hers don’t have cute details!